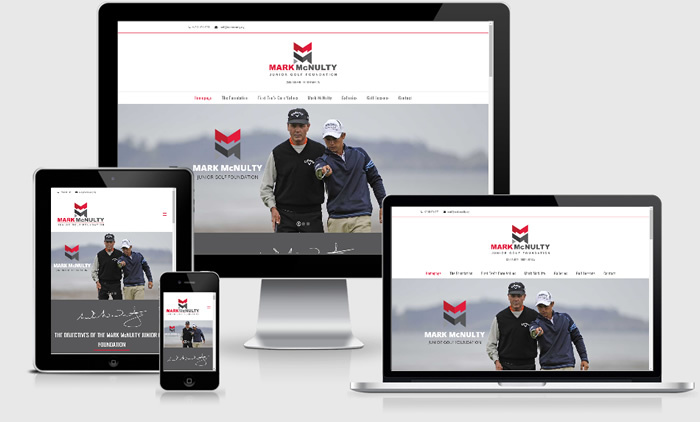 Professional Golfer Mark McNulty approached us to redo and modernize his Junior Golf Foundation Website. We also designed the new logo. This was used as a design element throughout the website. Many thanks for all your hard work in building the Foundation’s website. It looks amazing and we are very happy with the finished product. Please read through our FAQ section where we hope to answer a lot of the questions you might have. This is not a complete list or meant to be, just the most frequently asked questions we fielded throughout the years. As every project is unique we quote each individually. The completeness of the information supplied is the biggest factor when it comes to giving a time-frame. Do you host the website as well? We can certainly do that. If you already have domain hosting sorted we will gladly build the website there. Can you take over my current site? For sure. If it is built on WordPress or HTML and we have access to the installation. Our websites are always designed with best SEO practices in mind. We offer both basic SEO and ongoing SEO services. What about responsive website design? The days of non-responsive websites are over. All our websites are built for ease of use on mobile devices. With WordPress being the backbone of our webdesign you will be able to do basic changes yourself, should you wish to. The more technical changes you can leave in our capable hands. For Ad Hoc changes we always quote on work to be done and we also have monthly maintenance options available. Ask us about that.